Until we understand the limits of life, it will be difficult to determine if alien planets can host any living beings, scientists say. By studying Earth-bound "extremophiles" — microbes that survive in harsh conditions, such as hot and acid-filled ocean vents — scientists can understand the limits of temperature, pressure and acidity that support life on Earth more fully. These finding may also be applied to other planets. "This is very much a discovery-based science, and there is so much we still don't understand," Baross said during the Search for Life Beyond the Solar System conference in Tucson, Ariz.
One emerging field of research examines microbes living in a low carbon and energy environment, like the parts of the ocean below where sunlight can reach through the waters. Considering slower evolution over millions of years in these reaches is a "totally new ballgame" for alien planet researchers, Baross said. Hosts for the conference include the University of Arizona's Steward Observatory as well as the Vatican Observatory, which is based just outside of Rome. Historically, science and religion have at times come to loggerheads at the Vatican. For example, when Galileo Galilei discovered moons around Jupiter in 1610, he said the Earth orbits sun rather than the other way around, in defiance of the church. The Vatican Observatory has made its own contributions to astronomy, pointed out José Funes, its current director. The 19th-century director Angelo Secchi was one of the first scientists to authoritatively say that the sun is a star, Funes said. Secchi, like scientists today, also mused on the possibility of life beyond Earth, a theme that Vatican scientists discussed at the conference, Funes added, putting a passage from Secchi's 1870 book, "Le Soleil" (The Sun) on the screen. "What to think of these stars without any doubt similar to our sun," the passage read, "destined like the sun to keep alive an enormous quantity of creatures of every kind?" Finding alien life will be a complex task, other scientists pointed out. 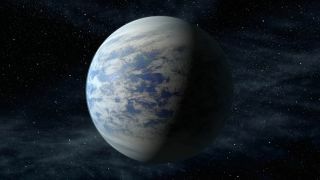 Perhaps extraterrestrials will require a "wet" planet like Earth and a "dry" planet like Mars to pass material back and forth, biochemist Steven Benner of The Westheimer Institute for Science and Technology in Florida said. Benner suggested that it might be easier for organisms to come alive in a dry environment, but that it would take water to make sustained life possible. Other researchers, meanwhile, are trying to better understand the parameters of life by creating synthetic lifeforms to see how they will behave in different environments. Lynn Rothschild of NASA's Ames Research Center, is the faculty adviser for Brown University and Stanford University students participating in the annual International Genetically Engineered Machine competition. Using DNA samples in a library, the students build artificial systems meant to address certain scientific questions like how to be more resistant to radiation. This can help supplement research on extremophiles where "there are not a lot of studies," Rothschild said.